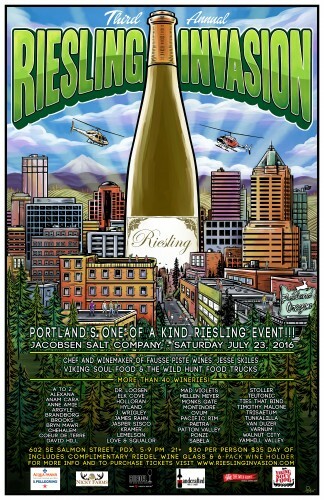 Pacific Northwest Riesling fans, don’t miss the third annual Riesling Invasion in Portland, Oregon! Your ticket includes entry fee to taste through more than 100 Riesling wines from more than forty wineries, including IRF Friends A to Z Wineworks, Brandborg, Brooks Winery, Dr. Loosen, Elk Cove, and Pacific Rim! You’ll receive a complimentary Riedel wine glass to keep and a 6-pack wine bottle carrier to carry home wines you purchase at the event. Food from Chef Jesse Skiles of Brasica, Viking Soul Food and The Wild Hunt will be available to purchase as you go. DJ Scott Frank will spin Riesling-appropriate groovy tunes! To learn more and buy tickets, go to the Riesling Invasion web page. Also, please watch this great new video about Riesling! Portland has been coming out with some phenomenal Riesling to complement the Chardonnays and Pinots. I can’t wait for this festival and am very grateful for learning about it. Thanks for posting this. Thanks for the good words, Jared. Riesling Invasion also features wines from beyond Portland and Oregon as well, including Washington State and Germany. Riesling, more than any other wine expresses the terroir from which it comes, so it’s always a great opportunity to compare locally produced Rieslings with their counterparts from other regions around the world.